CMDSport is a magazine “for those who live sport passionately”. CMDSport offers key information for all those sports people and sports fans who want to find out information about the world of sport or share experiences. The magazine has an online edition, a printed edition and weekly newsletters, that provides the best and most complete information about the world of sport for the entire family. 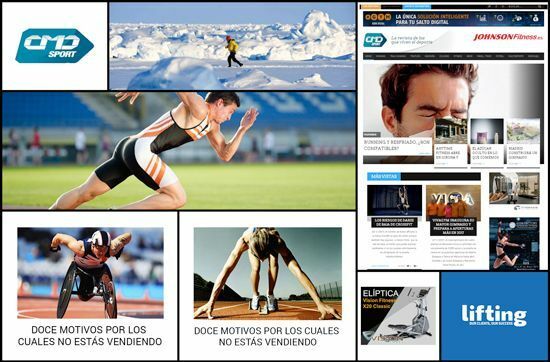 Furthermore, CMDSport is not only for the end user, rather it is an essential tool for professionals in the world of sport. Thanks to the constant update of information professionals are kept informed all the time and are therefore able to make appropriate decisions. From the moment CMDSport made contact with Lifting Group our team of Consultants started developing a Responsive Design web page with the aim of improving the visibility and positioning of the brand. In parallel in Lifting Group we prepared a Digital Strategy based on site optimisation of the web page and on the development of a Search Engine Optimization (SEO) strategy for increasing the organic traffic to the page and generating an increase in subscribers. Thanks to the work carried out by our expert Consultants, CMD has managed to improve their position and visibility, and increase the traffic to the page. Increase the traffic to the web page. Increase the number of subscribers to the Newsletter. Increase the followers on Social Networks. Increase of 34% in overall traffic to the page. Increase of 10% of organic traffic. Reduction in the bounce rate. Increase in the average duration of the session.